Happy New Year, everyone! To celebrate the new year, I’m going to try and start things off right and keep this week focused more on what I would consider academic titles. Higher level thinking type stuff. Unlike that last sentence…and you might disagree with this title fitting in with the others, but it flips a genre on its head, so I’m content with it. So why this title during Cerebral Week? 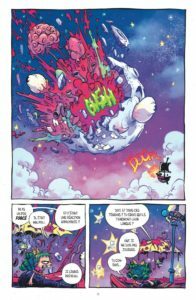 Just look at Gertrude in issue one blowing the brains and guts out of the moon only to then mutilate stars with angry cannon balls, letting the bleeding stars fall screaming to the Earth, and tell me that this book doesn’t make you think. This book takes the Fairy Tale genre and obliterates what one has come to expect from it. Our little, angry protagonist, Gertrude falls into Fairyland, a nice little place of rainbows and cute creatures. She is given a guide and a map and is told that when she finds a special key, she can unlock her way back home. We turn the page to find that twenty-six years have gone by, and Gertrude has yet to find the key. She is still in the little girl’s body, but has mentally aged the twenty-six years, making her a miserable, dangerous pain that seems unstoppable, driving her ax into whatever problem is thrown at her. And yes, most of the time, we see the ax go right in. This book, while cute and colorful, is brutally gory and I would not say safe for work, but damn is it fun! I’m only three issues in, and I don’t know where this thing is going, but based on the issue covers that I have in my box waiting for me, it doesn’t get any less brutal. 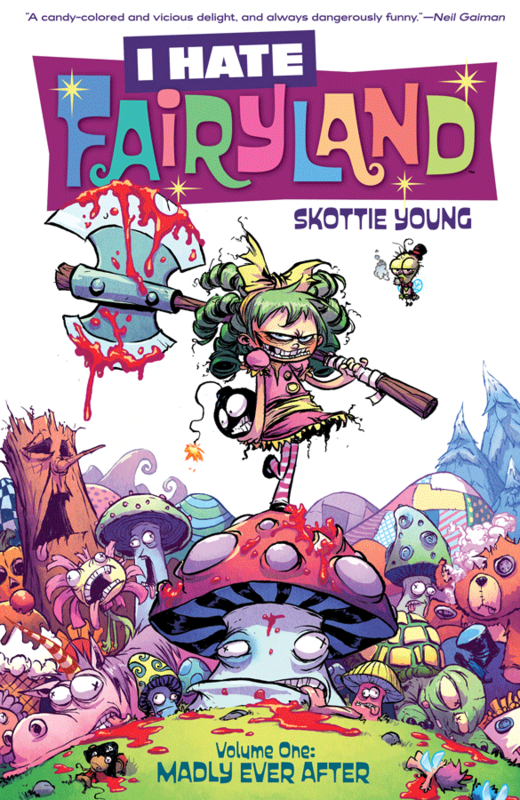 I love the artwork of Skottie Young; I have ever since I got back into comics. His cute, cartoon-y style plays magnificently against the cartoon blood. And the coloring by Jean-Francois Beaulieu take Young’s images to Fairyland. The bright, vibrant, pastel palette brings us to a happy place before a headless warrior splashes onto the ground in front of us. Sounds interesting, right? You don’t know the half of it.